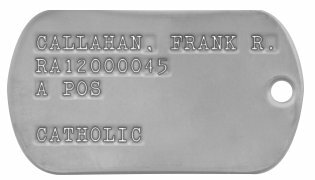 What is a Dog Tag? 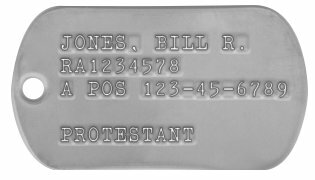 A dog tag is the informal name for the identification tags worn by military personnel, because of their resemblance to actual 'dog' tags. The tag is primarily used for the identification of dead and wounded along with providing essential basic medical information for the treatment of the latter such as blood type and history of inoculations. 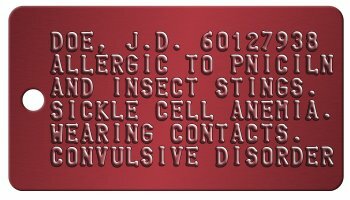 In the event the member has a medical condition that requires special attention, an additional red tag with the pertinent information is issued and worn with the dog tags. 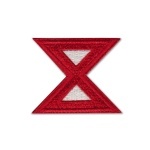 Wearing of the tag is required at all times by soldiers in the field. In the U.S., two identical tags are issued. One is worn on a long chain around the neck; the second on a much smaller chain attached to the first chain. In the event the wearer is killed the second tag is collected and the first remains with the body. Yes - we make the real thing. 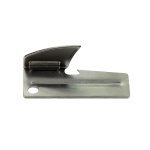 Made according to military specifications with 304 rolled-edge stainless steel and embossed using the same automated machinery as used on military bases. 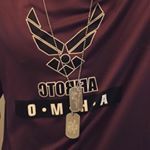 Why are two tags issued in each set of Dog Tags? 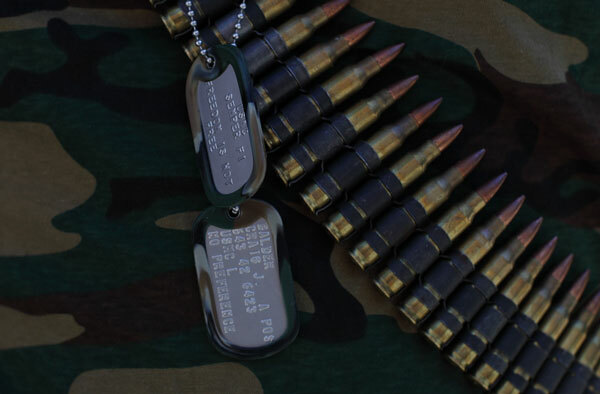 In the military every soldier is issued two ID tags as soon as possible after entry on active duty, initial active duty for training, or assignment to a Reserve Component unit. 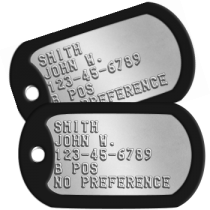 Dog Tags are used for identification, casualty reporting, and graves-registration purposes. In the unfortunate event that they are killed in combat, one tag would stay with the body (sometimes attached to the toe using the short chain) and the other tag would go with a scout and eventually to the next of kin. 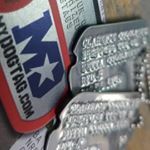 In keeping with this military tradition, we only sell our tags in sets of two, however each tag from mydogtag.com can still be individually customized. Where can I find official specs for USA military dogtags? The following resources link directly to the appropriate page on PDF files hosted on government websites. 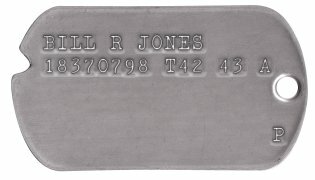 Where can I find my personal information to put on the Dog Tags? What is the evolution of US Army Dogtags? Dec 20 1906 : Introduction of single Dog Tag by General Order No. 24. 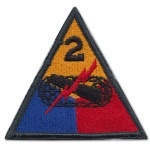 Jul 06 1916 : Introduction of second Dog Tag (complete pair). 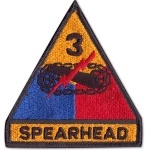 Feb 15 1940 : Official stocklist number & nomenclature adopted "TAG, IDENTIFICATION, M-1940 - Stock No. 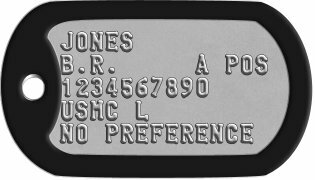 74-T-60"
Sep 02 1949 : New Army Regulations AR 615-30 and replacement of "Army Serial Number" designation by "Army Service Number"
1950 : Introduction of the "Rh" factor on Dog Tags, with indication of either "POS" or "NEG" after Blood Type. 1952 : Introduction of the letter "X" to designate other religious affiliations not covered under Protestant/Catholic/Jewish faith groups, and the letter "Y" for those who did not have a religious preference. The letter "J" replaced "H" for Jewish US servicemen. 1960 : Notched Dog Tags are no longer used, as new Embossing Machines don't require them for positioning. Late 1960 : Tetanus inoculation is no longer indicated. Nov 1962 : Religion codes (i.e. P, C, H) were replaced with the soldier's religion fully spelled out (i.e. Catholic, Protestant). 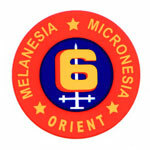 Jun 30 1969: : Use of "Army Service Number" terminated. Were civilians ever issued dog tags? 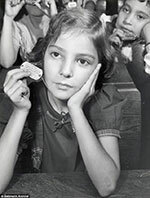 Children as young as six were forced to prepare for nuclear Armageddon during the Cold War ... and even had ready-made DOG TAGS so their parents could identify their bodies in the event of a nuclear fallout. 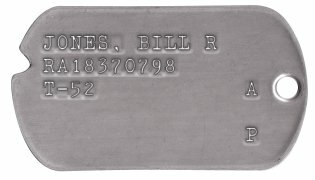 U.S. Army format dog tags, modern mil-spec embossed stainless steel. Use as a replacement or spare for regulation issued set. 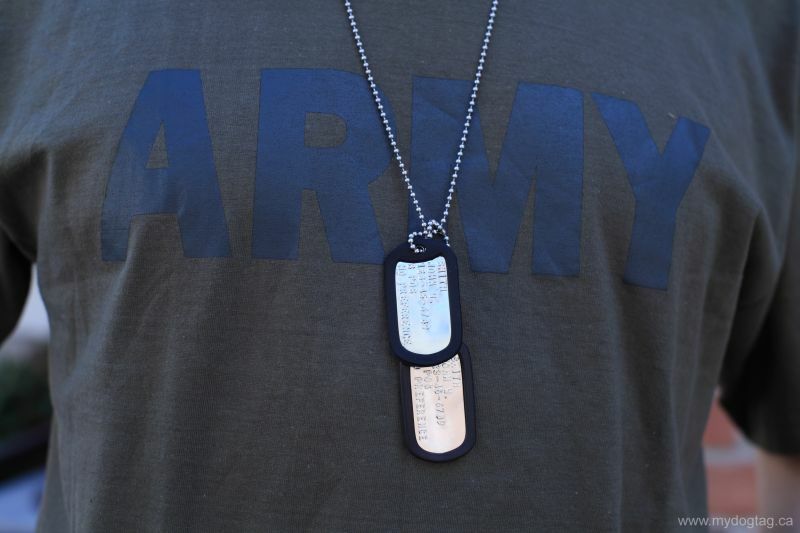 See more details about our Army Dog Tags or Customize yours now! 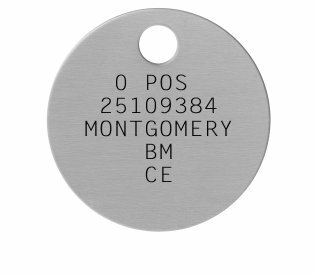 You may also be interested in our reproduction army dogtags from historical eras such as WWII, Korean War, Vietnam War, modern Army Medical Warning Tags, and Army Motto Dog tags. See more details about our USMC Dog Tags or Customize yours now! See more details about our Navy Dog Tags or Customize yours now! See more details about our Air Force Dog Tags or Customize yours now! 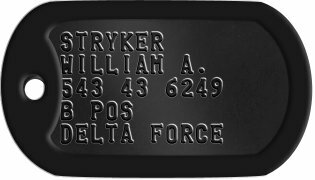 Black dogtags are used by Special Operations forces such as the Army Rangers, Navy Seals, Green Berets, Commandos, and Delta Force. See more details about our Special Forces Dogtags or Customize yours now! 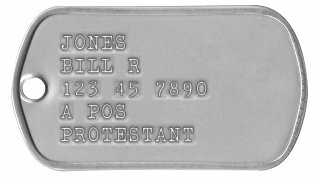 See more details about our British Military Dogtags or Customize yours now! 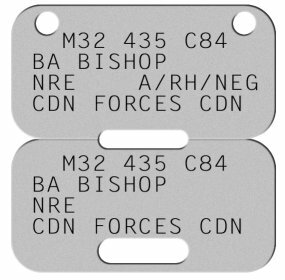 See more details about our Canada Forces Dogtags or Customize yours now! 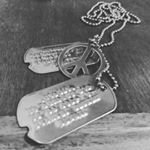 See more details about our Vietnam 1970-74 Dog Tags or Customize yours now! See more details about our Vietnam 1967-69 Dog Tags or Customize yours now! See more details about our Vietnam 1965-67 Dog Tags or Customize yours now! 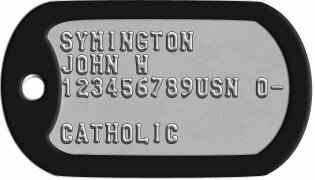 See more details about our Vietnam 1954-64 Dog Tags or Customize yours now! 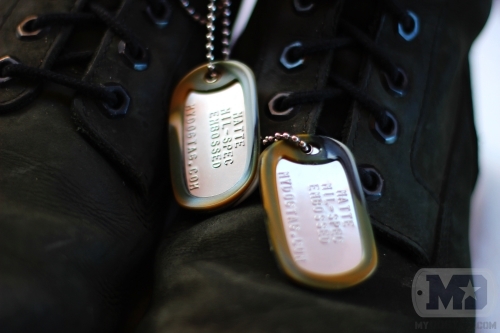 See more details about our Korea 1950-53 Dog Tags or Customize yours now! World War II era style dog tags (4th type March 1944 to April 1946). Rolled edge down, with debossed text and notch. Made of stainless steel (not monel). See more details about our WWII Army Dog Tags 1944-46 or Customize yours now! You may also be interested in our other historical WWII era dog tag reproductions from 1940-41, 1941-43, and 1943-44. See more details about our WWII Army Dog Tags 1943-44 or Customize yours now! 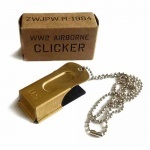 See more details about our WWII Army Dog Tags 1941-43 or Customize yours now! 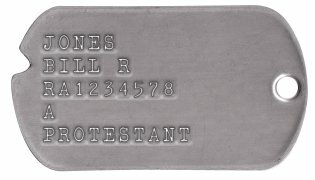 World War II era style dog tags(1st type December 1940 – November 1941). Rolled edge down, with debossed text and notch. Made of stainless steel (not monel). 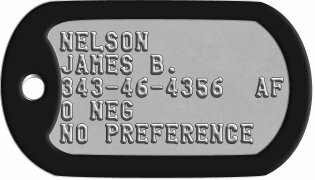 See more details about our WWII Army Dog Tags 1940-41 or Customize yours now! You may also be interested in our other historical WWII era dog tag reproductions from 1941-43, 1943-44, and 1944-46. In World War II members of the Navy wore dogtags of a different shape than the Army and Air Force. They were oval shaped, had either one (P1917) or two (P1940) holes, and were engraved or etched rather than debossed or stamped. 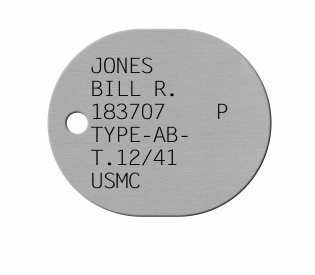 See more details about our WWII Navy & USMC Dog Tags 1921-50 or Customize yours now! 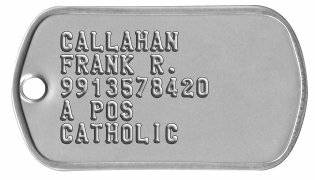 You may also be interested in our other historical WWII era dog tag reproductions for the U.S. Army from 1940-41, 1941-43, 1943-44, and 1944-46. All orders are shipped within 1 business day and are usually delivered within 1 week (in North America). If you need any assistance creating or ordering your Military Dog Tags please contact us directly, we are here to help!